"How can I transfer podcast from iPhone to iTunes? – I have several podcasts downloaded on my iPhone and would like to transfer podcast from iPhone to iTunes. Is this possible? And how to transfer iPhont podcast to iTunes library?" You could transfer podcast from iTunes to iPhone via the sync function inside iTunes. Actually, the reversed operation is also supported by iTunes. That means, you could also trasnfer podcast from iPhone to iTunes via the sync feature. This post would show you how to transfer iPhone podcast without iTunes and with iTunes respectively. Navigate tothe Podcast option and open it. Turn on "Sync Podcasts" option. Connect you iPhone to the computer. Note: your iPhone must be authorized. Choose "Edit > Preferrences > Store" (iTunes > Preferences > Store on Mac) tab. Select "Sync podcast subscriptions and settings. Now, you can enjoy the iPhone podcasts on the computer any time you want. With iTunes, you could easily transfer podcast from iPhone to iTunes. But you need to remember that iTunes sync all podcasts from iPhone to iTunes. 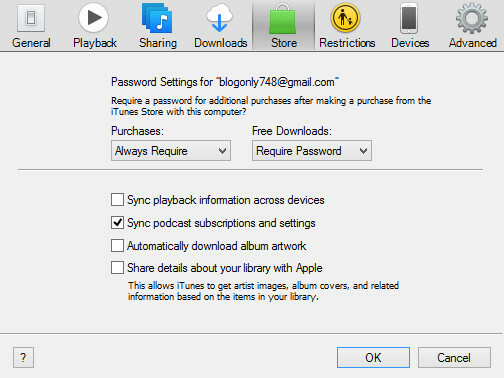 If you want to transfer podcasts you want to iTunes from iPhone, you could go to the following method. Why do you need to use Leawo iTransfer to transfer podcast from iPhone to iTunes? It helps you transfer selected podcasts from iPhone to iTunes. 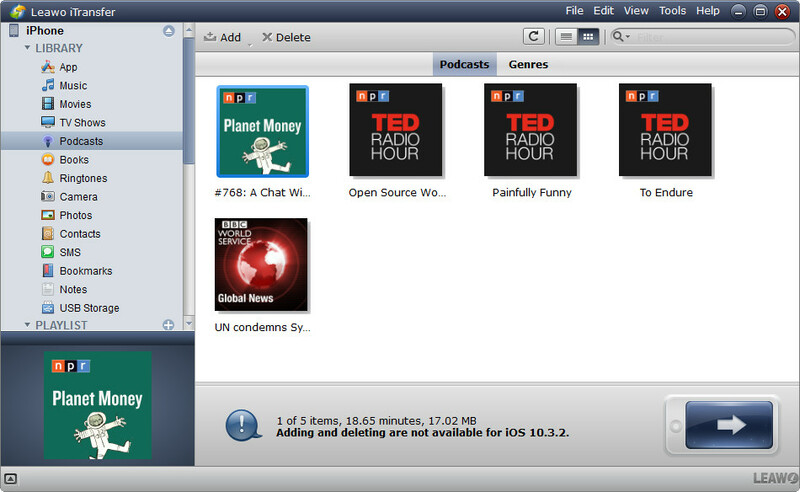 And you could preview every podcast within Leawo iTransfer before you could transfer iPhone podcast to iTunes. Leawo iTransfer is a professional iOS data transfer software app that could help you transfer up to 14 types of data and files between iOS devices (iPhone, iPad and iPod), iTunes and computer. 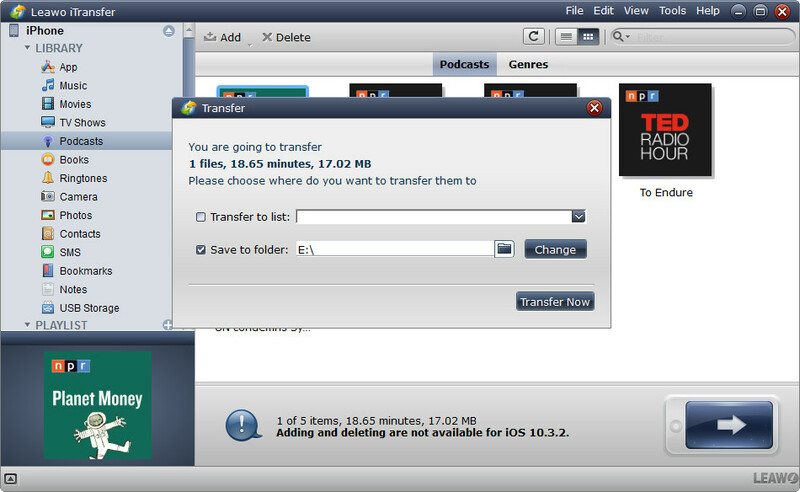 You could use this iPhone transfer software as an iPhone podcast transfer app to freely transfer podcast from iPhone to iTunes, and vice versa. Download and install this iTransfer on your computer. The below steps would show you how to transfer podcast from iPhone to iTunes. Select a podcast and right click to choose "Transfer to > My Computer" option. Set a directory as output folder to save the transferred podcasts. After setting output folder, click the "Transfer Now" button. Then selected podcasts would be transferred immediately. After the transfer, you could then find the transferred podcasts in target folder. Now, what you need to do is simply open your iTunes and click "File > Add file to library" option to add podcasts you’ve just transferred from iPhone to iTunes.